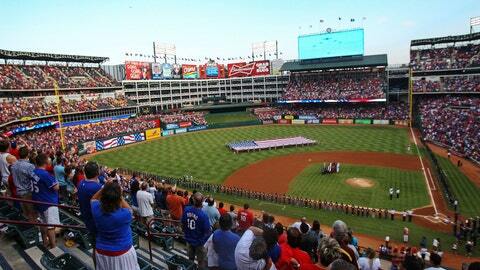 A general view of the field during the National Anthem before the game between the Texas Rangers and Seattle Mariners at Rangers Ballpark in Arlington. With an almost 50,000-seat capacity, Rangers Ballpark has seen a lot of faces over the past year. So much so that it came in at No. 6 in Facebook’s "Top check-ins in the United States" for 2013. The popular social media website released its annual year in review Monday, highlighting all the top trends on Facebook. The home of the Texas Rangers were included on that list with the likes of Times Square, Epcot and even the Houston Livestock Show & Rodeo. While No. 1 on the list was the Happiest Place on Earth (Disneyland), Rangers Ballpark did manage to beat out the popularity of Fenway Park in Boston. Dodger Stadium in Los Angeles and AT&T Park in San Francisco ranked higher. Interestingly, no football or basketball stadium or arena, professional or collegiate made it onto the list. Maybe this means baseball is still America’s favorite pastime? Or it could mean there is a lot more downtime to play on your phone.